My dad built an rocking horse for my 1st nephew. We decided should build 1 for my other nephew. 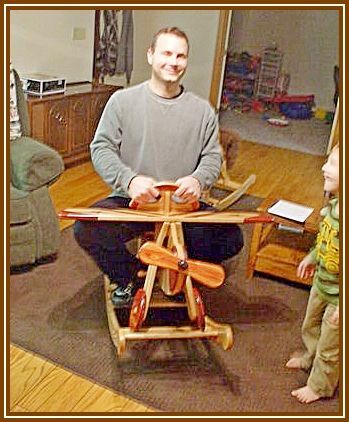 We didn’t want to build the same rocking horse so we went on line and saw a plan for this plane. It was pretty plain, all pine and painted. We couldn’t do that. So we used 6 different woods. We inlaid the stairs and strips, bent the wood for the steering wheel. I Like This! Will it Hold ME Daniel? A Measly 250 pounds. Maybe I can Scale It Up? Awesome rocker! Cool design, like the attractive wood colors and great finish. Definitely the kids will love it. Great job!